In the Arab Lounge dating account, Farook described himself as an “Allah fearing, calm thought full [sic] and simple man.”“I am born and raised here, I try to live as a good Muslim.” He went to his mosque, prayed 5 times daily and memorized the Quran. All the media reports mirror image each other. Good, devout Muslims who somehow became self radicalized. None of them ask the question as to how a good, devout person who believes in God could after reading, memorizing the Quran - a book of pure peace and love go against God and commit the most evilest act any person could commit against God; To kill in God’s name. The answer is really quite simple. The Quran is not a book of peace and Islam is not a religion of peace. These Muslims are obeying it’s teachings exactly as written. I can read the Sermon On The Mount and memorize every word and will never go out and kill. You have heard that it was said, ‘Eye for eye, and tooth for tooth.’ But I tell you, do not resist an evil person. If anyone slaps you on the right cheek, turn to them the other cheek also. I can read the Old and New Testaments, memorize every word and never commit acts of evil. God is not a criminal. God is not a male chauvinist pig. If God killed or ordered the killing of just one human being or any other creature throughout the entire universe or committed any criminal act then God would no longer be Moral Perfection and therefore no longer God. GOD WOULD NOT EXIST. God cannot have as His prophet a criminal otherwise God is an accomplice in ALL crimes committed by His prophet and no longer Moral Perfection but a monster. If I read or someone tells me I can kill in God’s name basic morality and common sense tells me that this is evil. That to kill is evil. That no God would ever order such an act and if He did - we as good, moral human beings would be obligated to tell God to go to Hell. One of the most important gifts God bestowed on mankind is empathy. The moral goodness to feel the suffering and pain of our fellow human beings. All Muslims lack a moral center and therefore empathy because to be a Muslim you must believe that every word of the Quran was dictated by God to Angel Gabriel and re-transmitted to Muhammad. THIS MEANS EVERY WORD OF THE QURAN IS FROM THE MOUTH OF GOD AND MUST BE OBEYED WITHOUT QUESTION. NO EXERCISING MORAL GOODNESS OR REASON - JUST EVIL, DEVOUT OBEDIENCE. Following are just 3 verses taken out of thousands in the Quran and Sunna ordering horrific murder, torture. Every word of these verses came from God via Gabriel to Muhammad. How could any normal, moral person believe that God would order: “execution (by beheading), or crucifixion, or the cutting off of hands and feet from opposite sides” “terror into the hearts of the unbelievers: smite ye above their necks and smite all their finger-tips off.” “strike off their heads” “when you have made wide Slaughter among them” These are commands to inflict horrendous pain and suffering leading to a horrible death and revile in their suffering. This is what makes Islam so disgustingly evil and all Muslims so disgustingly evil is that they take God and turn him into a monster to justify their great crimes. A good, moral human being when reading these Quranic verses would immediately run out of the mosque, renounce Allah, the Quran and Muhammad. A good devout Muslim runs out of the mosque obeying the Quranic verses gets Ak 47’s and pipe bombs and murders kafirs. As will be stated countless times for the Quran to be the word of God EVERY word must be Moral Perfection. Just one immoral word let alone an entire teaching and ALL Islam is fraudulent. We have just in these 3 immoral, evil verses - 130 immoral words. To believe that God stated these verses to Gabriel is such evil, evil. 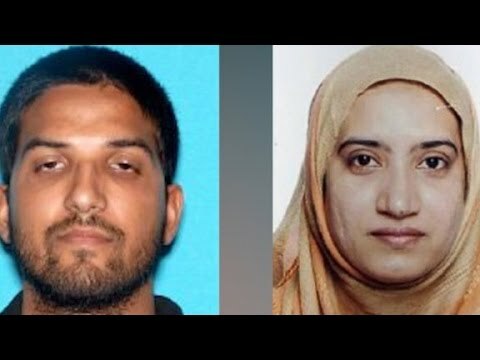 All media outlets even including Fox and the FBI are all asking the greatest fraudulent questions to deceive the American people: How these good devout killers became self radicalized by Radical Islam? Did she radicalize him etc.? These commentators create the illusion that there are 2 different Islams: Radical Islam and the Moderate Islam. THERE IS NOT. THERE IS NO SELF RADICALIZATION. THERE IS NO RADICAL ISLAM. THESE 2 MUSLIMS WERE GOOD, MORAL, MODERATE, DEVOUT MUSLIMS OBEYING EXACTLY THE QURAN AND SUNNA. THE QURAN IS NOT THE BOOK OF GOD BUT A BOOK OF PURE EVIL AND MUHAMMAD WAS NO PROPHET PERIOD. Muslims by remaining Muslims have renounced God and sacrificed the very essence of their very humanity - their souls.